Maria Ji has always been passionate about reading and writing but 2013 was the first year she wrote and performed performance poetry. 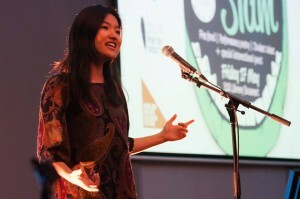 She came 3rd in the University of Auckland Annual Poetry Slam, was the NZ Poetry Slam Auckland Regionals champion (performing in the regional heats and regional slams), and was one of 3 poets representing Auckland at the national poetry slam in Wellington. Maria is a new voice in the poetry scene but one that we should all be very excited about.